Tampa, FL – April 7, 2012 – It was a night of nail-biting excitement as 32 of the nation’s top riders went head-to-head in the 2012 $200,000 Gene Mische American Invitational presented by G & C Farm at Raymond James Stadium. It was with speed and accuracy that Mario Deslauriers was able to triumph tonight with Cella during a five-horse jump-off. They raced through the finish line in 44.50 seconds after completing a clear short course during the Molly Ashe-Cawley posted a speedy time aboard Carissimo, leaving all rails in their cups and capturing the second place prize in 45.81 seconds. Beezie Madden was the third of the double-clear efforts, but her time of 46.31 seconds proved too conservative, taking the third place honors for the evening’s event. 2008 Olympic course designer Steve Stephens of Palmetto, FL, designed tonight’s demanding course. The thirteen numbered obstacles featured a vertical-oxer double combination, a long oxer-vertical-oxer combination, a colonnade wall, Stephen’s signature bicycle vertical, a skinny horseshoe vertical and a liverpool. The most difficult obstacle proved to be the bicycle vertical, resulting in thirteen pairs knocking the top rail to the ground. Laura Kraut and Cedric were one of the teams to fall victim to the problematic vertical. The duo raced forward through the remaining obstacles, however, to stop the clock in a blazing 80.870 seconds, the fastest four-faulter. They eventually took the sixth place honors. 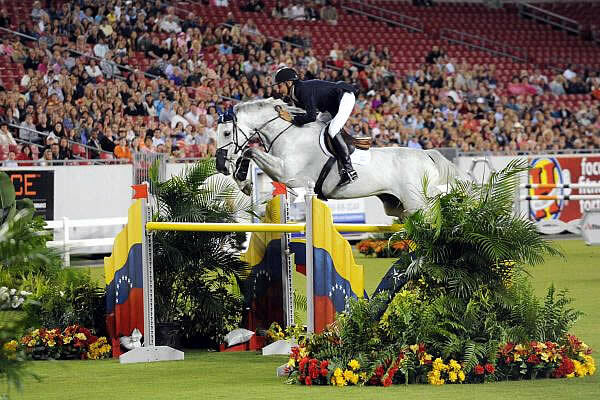 Kraut was one of nine four-fault riders, including Matt Williams, Shane Sweetnam, Richard Spooner, Meredith Michaels-Beerbaum, Marie Hecart, Darragh Kenny, Pablo Barrios and Reed Kessler. Charlie Jayne and Athena, owned by The London Group, was the third rider on course and the first to complete a clear effort. Eleven rounds later, the defending champion Kent Farrington and Uceko, owned by RCG Farms, tripped the timer without incurring any jumping faults. His clear round guaranteed a jump-off. Beezie Madden left nothing to chance as she entered the ring as the twenty-fifth rider to attempt the course. She procured an exceptional first round attempt, leaving all rails in their cups and joined the ranks in the jump-off. It has been ten years since Molly Ashe-Cawley has had a victory for the prestigious event; however, her clear round gave her another opportunity to take the win and ride Carissimo, owned by Maarten Huygens, to the top. Cella with Mario Delauriers in the irons also provided a clear round to move into the jump-off and vie for the championship. The jump-off round began over a single green oxer, and riders made a left turn over the colonnade wall. A quick right turn then moved the riders through the difficult vertical-oxer combination and into another right turn over the horseshoe vertical. From there, the horse and rider combinations were introduced to two new obstacles – the American Invitational vertical reversed and the Land Rover vertical. They then made a sharp right rollback over the brick-clad oxer and with a right turn finished over the final oxer. Jayne and Athena were the first to show over the shortened track; however, they proved that the course was no simple feat to maneuver. They accrued sixteen faults for their effort, and earned an additional fault for a time penalty, resulting in 17 faults overall. Their jump-off round eventually earned the team the fifth place ribbon. The rounds only seemed to grow increasingly better with each go. Farrington was the next to compete in the jump-off; his pure determination had the entire stadium on edge as the anticipation rose. Farrington guided Uceko over the course brilliantly, but the rail went down on the final obstacle, the G & C Farms oxer. They finished with a four-fault total and the time of 45.10 seconds. Farrington was awarded the fourth place award. It was Madden who piloted Simon to the first double-clear effort of the night. Hopes were high as they soared over the fences and it seemed as though Madden would have a chance to win her third American Invitational. She took a conservative approach to the course, effectively clearing all obstacles. Her time of 46.310 seconds left the door open, eventually placing Madden in the third place position. It has been ten years since Ashe-Cawley emerged victorious at the 2002 American Invitational. She is one of only three victors to win in consecutive years, and her thirst for the first place prize was apparent as she made her way through the short course. Carissimo stayed straight and true through the obstacles, moving with a firm pace. After landing from the Land Rover vertical, they attempted to slice the turn to the oxer, but she lost time after the turn did not go as smoothly as planned. Racing from the penultimate obstacle toward the final oxer, they made up some time and broke the beam at 45.810 seconds with a clear round, but it proved only good enough for the second place prize. The last to attempt tonight’s short course was Deslauriers aboard Jane Forbes Clark’s mount Cella. Together they maneuvered their way easily over each fence with Cella proving his agility and precision over the fences, avoiding any faults. Deslauriers effectively shaved off 1.31 seconds slicing the turn to the second to last obstacle, as well as leaving out a stride to the final oxer. They sped to the final fence and tripped the timers at 44.50 seconds, an outstanding time and brilliant effort. Clark commented on the victory, “It feels terrific to have this win; it is my first as an owner. It was a very big night and a truly exciting event.” Clark is well-known for her efforts as the President of the United States Equestrian Team Foundation, and she was inducted into the Show Jumping Hall of Fame tonight in front of the 8,800 spectators. Clark has made tremendous motions in the equestrian world, and it is because of her accomplishments, and what she has brought to the sport, that she was nominated by the Election Committee as a 2011 inductee. Clark also owns Deslauriers’ other mount, Ucecko. “I think I have been in the American Invitational at least 10 or 12 times. I have been second and third and gotten a couple good prizes, but never won. This was a great win tonight, and I am so pleased with our rounds. Cella was incredible and she jumped fantastic,” Deslauriers concluded. For more information about the 2012 $200,000 Gene Mische American Invitational presented by G & C Farm please visit www.stadiumjumping.com.